This was the fifth game of the 2015 season for the Benzie Central Girls Varsity Soccer team, and the team’s second away game. Our BCHS girls were very evenly matched with the Northport team, so watching the play was a lot of fun (despite the cold). 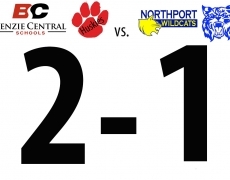 However, our girls seemed to have more gumption and drive than the Northport team, so we seemed to have more offensive plays which resulted in more goals. Emma Husoy had one goal and one assist, so she won our “offensive player of the game” award. We still had to play a lot of good defense to hold the lead, but we managed to do this, too. Overall, good showing by the Lady Huskies — our first win of the season! Note: We were missing Peyton Campbell and Brenna Harm for this game and the next, as they are in Washington D.C. for Close-Up. Deb Lehn (Molly’s mom) brought cheese and crackers and veggies for halftime snack. Coach Aubrey Ann Parker brought bananas. We also had apples and oranges from the school.